First Alert Action Day: Snow slowing, but very cold early in the morning! Along with the snow, temperatures have taken a dive and will be near or a few degrees below zero through 7 AM in the Denver area and across much of the I-25 Corridor. A gusty northwest wind will make it feel like 10 to 20 degrees below zero on exposed skin. DENVER — An Arctic blast has delivered over a foot of snow to the mountains and 3 to 6 inches of snow to Denver and the northeast plains. A Winter Weather Advisory is in effect through 9 a.m. for Denver, Fort Collins, Greeley, much of northeastern Colorado, along with the mountains east of the Divide. Winter Storm Warnings in the mountains will expire by mid-morning, but road conditions will take a while to improve. Many area schools and some businesses will be on delayed opening this morning - watch Denver7 for all the details. Skies will clear, but temperatures will stay quite cold through the day. 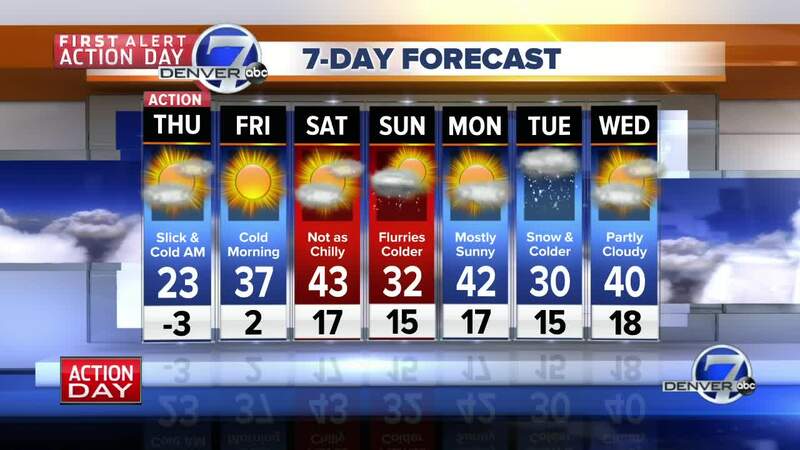 Highs will only be in the low to mid-20s for Denver and the eastern plains. Mountains will be in the teens and 20s - great skiing, but very chilly. Skies will be clear overnight and Friday morning with lows of zero to 10 above for lower elevations and ranging from 20 below to 5 above in the mountains. Friday will be sunny and not as cold in the afternoon with readings back in the mid-to upper 30s in Denver and in the upper 20s to low 30s in the mountains. Saturday will be partly cloudy and milder with highs in the low 40s. A weak cold front will bring a few inches of snow to the mountains Saturday night and Sunday, with a few flurries possible for Denver. Monday will be dry and a little milder, followed by another chance for accumulating snow on Tuesday.